I feel like a gramophone needle placed at the very edge of the record and moving inwards towards the first track (email to NE:02 06 2013). I participated at The Courtauld Institute of Art’s workshop series ‘The Listening Art Historian’. As I remarked to MZ (one of the organizers), in respect to the study of sound and art history we are still at the periphery of the interdiscipline. And an interdiscipline must be doubly disciplined. We need to develop: methodologies; a shared vocabulary; hypotheses and hunches; an agenda of lines of inquiry; investigative tools and technologies; further fora for critical and energetic discussion; events to present practice-based articulations of this discussion; and collaborative networks linking institutions, competences, and specialists (such as art historians, visual-cultural scholars, musicologists, practitioners and historians of sound, art practitioners, and mind-scientists). The Angelus (1857–9) portrays two peasants. They are standing still, reciting a prayer (audibly, possibly) against an acoustic backdrop: the sound of the church bell that summons them to worship. The painting conveys only a partial account of the scene, for we hear neither their speech nor the ringing. These aspects of the narrative can no more escape the vacuum of two-dimensional space than the picture-plane can accommodate the third dimension, literally. Whereas physical volume and spatial relations may be rendered illusionistically by the conventions and techniques of perspective, the implied acoustic volume has no comparable artifice to assist. Sound can only be connoted through the depiction of its source, course, and effect, or else ‘heard’ by a receptive imagination (in the mind’s ear). The paper discussed several interrelated aspects of the relationship between sound and representation: visual signifiers of sound (objects, substitutions for speech-acts, and non-verbal communicators, such as physiognomics and gesture); silence as a function, theme, and attribute, and as a dysfunction, limitation, and abstraction of images; silence as a signifier of religious reflection; silence as a condition of stillness; the percipient/audient’s reception of silence in images and of silent images in the context of noise; and the visualization of silence and sound in other works, such as Fra Angelico’s The Annunciation (1438-45) and Guercino’s Semiramis Receiving Word of the Revolt of Babylon (1624). It was observed that some paintings are quieter than others. 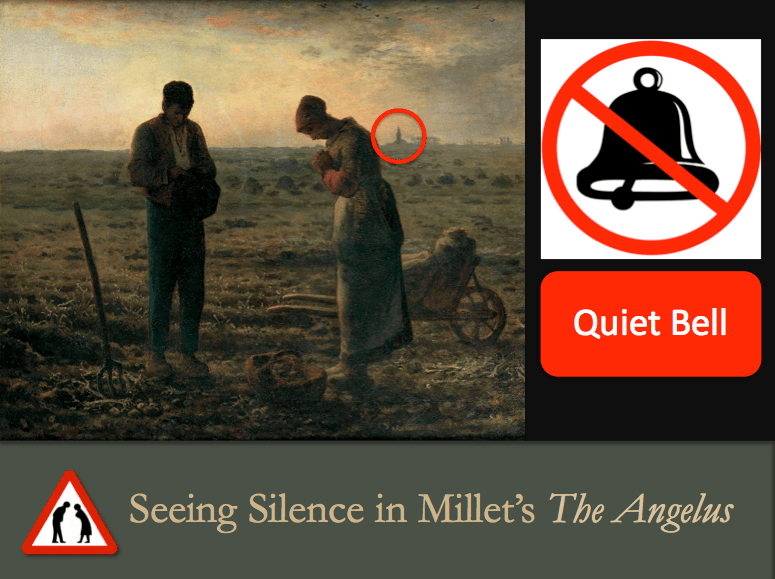 At the close of the presentation the audience listened to The acoustic Angelus, a conjectural audio representation of what Millet’s painting might sound like. 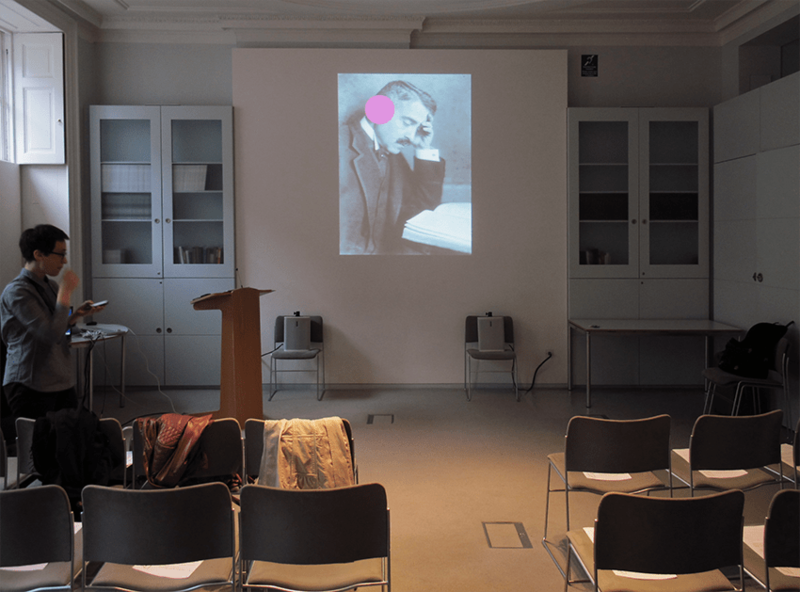 Workshop Series: ‘The Listening Art Historian’, Art History & Sound, Research Forum, The Courtauld Institute, London (2012-13).